Researchers are probing the health and economic fallout from this year's record allergy season to understand how warming weather and shifting rainfall may lead to more widespread and costlier allergy problems in the future. Already, doctors are seeing climate change alter how allergens disperse. "It played out in the form of the duration of the pollen season," said Leonard Bielory, an attending physician and allergist at the Robert Wood Johnson University Hospital and a professor at Rutgers University's Center for Environmental Prediction. A $21-billion-a-year U.S. allergy problem is likely to expand with climate change. Photo courtesy of iStockphoto. "The worst was in the beginning of the year," he said, noting that New Jersey faced record high pollen counts in February (ClimateWire, April 30). As the pollen and dust settle, researchers throughout the United States are calculating just how bad this year was and how much worse it can get. Itchy eyes and runny noses are rarely fatal, but the risk of allergen exposure is increasing as insects migrate north to newly hospitable land while oak, birch and ragweed disperse pollen more intensely and for longer stretches of the year. "As you go north, the more frost-free days, the longer the ragweed season," Bielory explained. The Asthma and Allergy Foundation of America reports that more than 60 million Americans have some kind of allergy. Such afflictions carry a hefty price tag of $21 billion annually with costs projected to rise much further, especially because Bielory expects pollen counts to double by 2040. "I personally didn't know that the impact of allergies and asthma is this large," said Kevin Lyons, an assistant professor of supply chain management at Rutgers University. Bielory and Lyons co-authored a paper in Current Allergy and Asthma Reports last month on allergies driven by climate change. The allergy expenses don't just come from treating them; a large chunk of the economic footprint comes from lost productivity as people stay home or work less to deal with puffy faces, labored breathing and rashes, according to Lyons. This can also have long-term consequences as students stay home from school and slow their education. 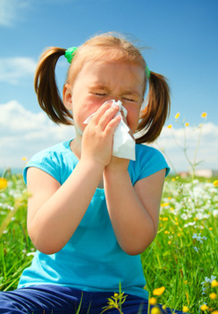 Lyons observed that temperature changes and erratic weather drive a cycle that could further worsen allergy risks. Natural and human-produced greenhouse gases change the climate, thereby altering how allergy-inducing plants, insects and molds spread. As more people are exposed, more people seek treatment, taking medications and visiting doctors. This increased consumption further drives energy demands and production of goods, which can increase greenhouse gas output. Now Lyons is examining this process to find ways to soothe coughing and watery eyes through cutting emissions, improving efficiency and shrinking costs. By delving into large data sets tracking production, emissions and consumer habits, he hopes to guide allergy sufferers to relief that helps them get better while minimizing the environmental and subsequent allergic consequences. Certain treatment regimens may prove effective, or it may be more worthwhile to improve indoor air quality by improving insulation and ventilation, depending on an individual's circumstances. As the sound of sneezing grows louder, the health care system will likely become more streamlined and efficient to deal with more patients. However, Lyons expects that the rate of new allergy sufferers seeking help will likely outpace any improvements from scaling up treatments. Lyons said he now wants to calculate the precise dollar costs of allergies and said his preliminary estimates show they may rise by 30 percent as the climate warms. In addition, he wants to extend this type of analysis to other products and supply chains to help manufacturers and consumers understand how products people buy affect their health and the environment.